Taxol is an anti-cancer drug harvested from Taxus trees, proposed ecologically to act as a fungicide. Taxus is host to fungal endophytes, defined as organisms that inhabit plants without causing disease. The Taxus endophytes have been shown to synthesize Taxol in vitro, providing Taxus with a second potential biosynthetic route for this protective metabolite. Taxol levels in plants vary 125-fold between individual trees, but the underlying reason has remained unknown. Comparing Taxus trees or branches within a tree, correlations were observed between Taxol content, and quantity of its resident Taxol-producing endophyte, Paraconiothyrium SSM001. Depletion of fungal endophyte in planta by fungicide reduced plant Taxol accumulation. Fungicide treatment of intact plants caused concomitant decreases in transcript and/or protein levels corresponding to two critical genes required for plant Taxol biosynthesis. Taxol showed fungicidal activity against fungal pathogens of conifer wood, the natural habitat of the Taxol-producing endophyte. Consistent with other Taxol-producing endophytes, SSM001 was resistant to Taxol. These results suggest that the variation in Taxol content between intact Taxus plants and/or tissues is at least in part caused by varying degrees of transcriptional elicitation of plant Taxol biosynthetic genes by its Taxol-producing endophyte. As Taxol is a fungicide, and the endophyte is resistant to Taxol, we discuss how this endophyte strategy may be to prevent colonization by its fungal competitors but at minimal metabolic cost to itself. Endophytes are typically fungi and bacteria that inhabit plants without causing disease symptoms . Some endophytes have been shown to benefit their hosts by improving nutrient availability, overcoming abiotic stress and as biocontrol agents against plant pathogens [2, 3]. In Lolium grasses, the fungal endophyte, Neotyphodium coenophialum, has been shown to protect its host against herbivory by production of a loline alkaloid, creating a symbiotic relationship . Taxol is a diterpenoid anti-cancer drug harvested from Taxus (yew) trees [5, 6]. Ecologically, Taxol is proposed to act as a fungicide . Interestingly, Taxus plants have been shown to host Taxol-producing fungal endophytes . Taxol is reported to be synthesized by at least 18 different fungal genera, primarily endophytes that live symptomlessly within Taxus and other trees [8, 9]. Fungal Taxol has been identified using HPLC/MS, a plant Taxol monoclonal antibody and NMR [10–12]. Though controversy exists whether plant compounds are required for its synthesis , fungal Taxol is produced independently of the plant following several rounds of in vitro culturing [10, 14, 15]. Recently we isolated a Taxol-producing fungal endophyte strain, Paraconiothyrium SSM001 from Taxus x media, and similarly demonstrated that it could produce Taxol in vitro independently of its host [16, 17]. Plant Taxol consists of a taxane ring derived from the methylerythritol phosphate (MEP) pathway with a phenylalanine-derived side chain . Other reports have suggested that the mevalonate pathway contributes to Taxol biosynthesis in older plants [19, 20]. HMGR and DXR are rate-limiting enzymes in the MEP and mevalonate pathways, respectively . We have recently demonstrated that fungi may similarly utilize both mevalonate and non-mevalonate pathways for Taxol biosynthesis , suggestive of redundancy in the plant and fungal biosynthetic pathways. Plant Taxol biosynthesis has been shown to require an additional ≥19 biosynthetic steps, with the committed step being taxadiene synthase (TS; EC 4.2.3.17) . It has been known that Taxol levels in intact trees vary by up to 125-fold from tree to tree [22–26], but the underlying reason has never been addressed. Specifically, plant Taxol levels vary by species  and even from tree to tree within a species; amongst other factors, the latter variation has been associated with tree age [22, 23] or season of sampling [27, 28]. As one possible mechanism, Taxol-producing fungal endophytes have been shown to elicit Taxol production in vitro from Taxus plant suspension cultures . Co-culturing of Taxus chinensis with Fusarium mairei fungus caused a 38-fold increase in a co-culture system , while F. mairei fungal broth caused a two-fold increase in Taxol production from Taxus cuspidata suspension cultures . In other studies, fungi have also been shown to elicit the production of other terpenoids in planta[30–32]. The mechanism of Taxol elicitation is not known, and there is no evidence that these fungi also elicit plant Taxol production in intact plants. Based on the previous literature, here we tested the ecological hypothesis that the dramatic variation in plant Taxol content may be caused by underlying variation in its Taxol-producing fungal endophytes acting as elicitors of enzymes in the plant Taxol biosynthetic pathway. An initial result in vitro using a T. x media cell culture line showed a moderate correlation between plant Taxol accumulation in vitro and the concentration of its resident fungal endophytic community [see Additional file 1]. To determine if there was a correlation between Taxol content and Taxol-producing fungal endophyte(s) in intact plants, tissue samples were taken from six nearby Taxus trees, representing five plant species [T. x hunnewelliana, T. canadensis, T. x media, T. cuspidata (S. et Z. ), and T. baccata (L.)]. Wood samples from each species were found to contain an endophytic fungus. Each fungus was cultured to purity; 18S rDNA sequencing showed that the identity of all fungi corresponded to Paraconiothyrium, with ~1% nucleotide substitutions in comparison to SSM001 ITS sequence [see Additional file 2], a Taxol-producing fungal strain that we recently characterized from local T. x media plants . As different endophytes could be present in each plant, the level of SSM001 fungus in each stem sample was measured semi-quantitatively using tRFLP-based fungal community 18S rDNA fluorescence fingerprinting. TRFLP is a PCR-based method which amplifies the entire fungal community using DNA pooled from plant tissue; amplicons are restriction digested, and the fragment size (x-axis, Figure 1A) indicates the fungal genotype, while the size of the peak (y-axis, Figure 1A) indicates the amount of fungus. A prior small-scale experiment showed that in planta fungal quantification using TRFLP was consistent with results using quantitative PCR [see Additional file 3]. Using tRFLP fingerprinting, cultured SSM001 showed a distinctive peak (490 nucleotide fragment) (Figure 1A, SSM001 panel) and the same peak was identified in all trees. The tRFLP peak sizes were used for quantification of SSM001 quantity in planta (Figure 1A, B). Plant Taxol levels from each pooled wood sample showed good correlation (Pearson coefficient r2= 0.70, P=0.0382) with the quantity of resident SSM001 (Figure 1B) [see Additional file 4]. Tree to tree variation in plant Taxol concentration correlates with the quantity of its resident Paraconiothyrium SSM001 fungal endophyte. For ecological sampling, single ~5-6 cm stem pieces from a diversity of Taxus trees were harvested and cut into small pieces. The majority of the subsamples were pooled for DNA extraction or Taxol quantification, and the remainder were used for isolation of endophytic fungus. (A) tRFLP DNA fingerprinting of the fungal endophyte community in the stem sample of each Taxus species were used for fungal 18S rDNA primer-based amplification and restriction. Cultured Taxol-producing fungus, Paraconiothyrium SSM001, was used as the positive control. Nucleotide sizes on the x-axis identify unique fungal isolates. The y-axis indicates the quantity of the fungal isolate. (B) Corresponding correlation between plant Taxol yield from the wood samples taken from different Taxus species and the Paraconiothyrium endophyte quantity in planta. 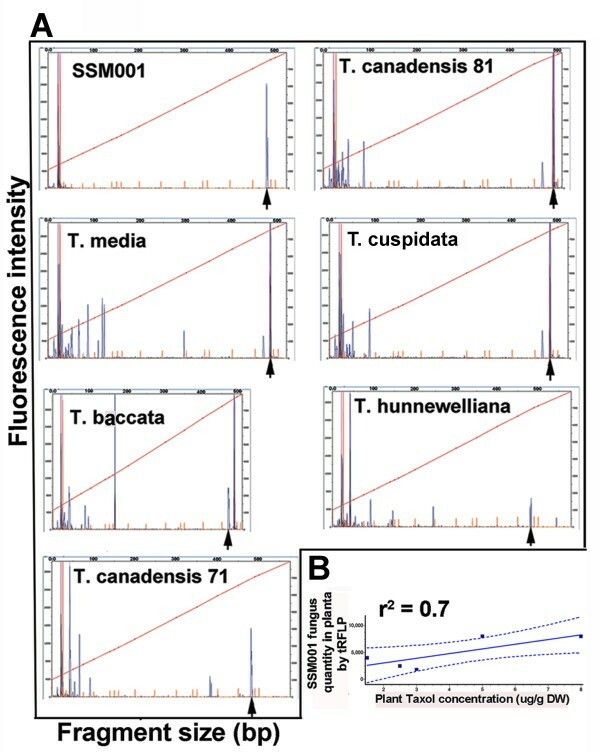 Identification and quantification of Paraconiothyrium endophyte were performed using tRFLP, a PCR-based technique which amplifies the entire fungal community using DNA collected from pooled plant tissue; amplicons are restriction digested, and the fragment size (x-axis, panel a) indicates the fungal strain; simultaneously, the size of the peak (y-axis, panel a) indicates the amount of fungus. For all experiments, a single 5–10 cm stem piece was harvested from each tree, which was divided into small sections of which ~8-10 were pooled for Taxol quantification and/or fungal DNA fingerprinting. Since endophytic fungal populations within a tree may vary at a micro-scale, Taxol was measured in different adjacent primary branches within an individual Taxus plant (Figure 2A) and compared to the quantity of endophytic Taxol-producing fungus Paraconiothyrium SSM001 (measured by tRFLP semi-quantitative PCR). Plant Taxol accumulation in adjacent primary branches showed good correlation (Pearson correlation showed, r2=0.72, P=0.0037) with the quantity of SSM001 fungi (Figure 2B). The experiment was repeated at a finer scale by measuring Taxol in adjacent secondary branches belonging to the same primary branch (Figure 2A). Plant Taxol in adjacent secondary branches again correlated with the quantity of SSM001 fungi (Pearson correlation, r2=0.71, P=0.0021) (Figure 2C). These data suggest that fine scale variation in Taxol yield within intact Taxus trees correlates with local variation in the amount of Taxol-producing endophytic fungi. Micro-scale plant tissue variation in Taxol quantity correlates with the quantity of resident Taxol-producing fungus. (A) Picture of a Taxus x media primary branch with secondary branches that were sampled. Primary branches are the first branches which initiate from the main stem, whereas secondary branches initiate from primary branches. (B, C) Pearson correlation between fungal endophyte SSM001 quantity and plant Taxol concentration in (B) different adjacent primary branches of the same Taxus plant, and (C) adjacent secondary branches belonging to the same primary branch. Each primary or secondary branch was used for fungal 18S rDNA tRFLP fingerprinting or plant Taxol quantification using the Taxol immunoassay; each Taxol data point is the mean of 3 technical replicates of the immunoassay. To characterize the effects of resident Taxol-producing fungi on the plant Taxol biosynthetic pathway in intact Taxus plants, we decided to treat plants with a potent fungicide, Maxim XL. The efficacy of Maxim XL fungicide on Paraconiothyrium SSM001 was verified in vitro: 0.1 μM was sufficient to completely inhibit the growth of Paraconiothyrium SSM001 on agar [see Additional file 5]. 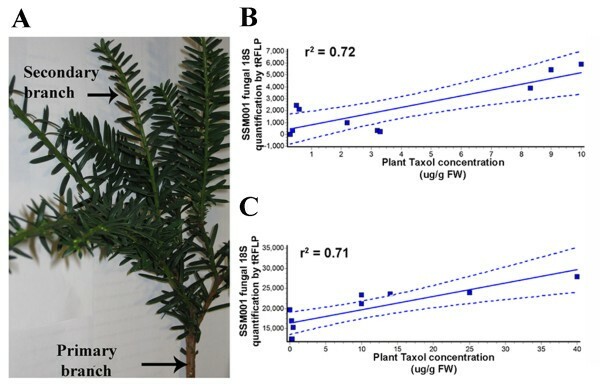 One-year-old Taxus x media plantlets were injected with different concentrations of fungicide (Maxim XL), and the injections were repeated over a three-month period (Figure 3A). Five months after the start of the experiment, the highest concentration of fungicide reduced plant Taxol accumulation (Figure 3B, C). The specificity of the fungicide was confirmed by decreased expression of fungal 18S rRNA in comparison to Taxus plant 18S rRNA which showed no change following fungicide treatment (Figure 3D). Additional plantlets were injected with the high fungicide concentration and again showed declines in the Taxol concentration based on TLC and HPLC measurements (Figure 3E, F). Endogenous fungi contribute to plant Taxol yield in (A-G) young plantlets and (H-K) mature Taxus wood by eliciting plant Taxol pathway gene expression. (A-D) Effect of injecting T.x media plantlets with Maxim fungicide. (A) Fungicide-injected plantlets showed systemic fungicide spread (red colour) from the injection site (arrow). (B) Taxane spectrum TLC for: Lane 1, standard Taxol and baccatin III (B III); Lane 2, buffer-injected plantlet; Lane 3, fungicide-injected plantlet. (C) Corresponding TLC quantification of plant Taxol. (D) Corresponding effects on endophytic fungal activity and expression of rate-limiting enzymes in the plant terpenoid and Taxol pathways: Lane 1, buffer-injected plantlet; Lane 2, fungicide-injected plantlet. (E-G) Effect of injecting two additional T.x media plantlets with fungicide and HPLC confirmation of Taxol. (E) Taxane spectrum TLC for: Lane 1, buffer injected plantlets, and Lane 2, fungicide-injected plantlet. (F) Corresponding HPLC quantification of plant Taxol. (G) Corresponding effects on endophytic fungal activity and expression of rate-limiting enzymes in the plant terpenoid and Taxol pathways: Lanes 1 and 2, two buffer-injected plantlets; Lanes 3 and 4, two fungicide-injected plantlets; Lane F, pure Paraconiothyrium SSM001 mycelia. (H-K) Effect of fungicide or herbicide on pools of T.x media mature cultured wood. For each of two biological replicates, 4–6 pieces were treated, pooled, and the data normalized by mass. (H) Cultured T.x media wood showing endophytic fungal growth. (I) TLC for cultured wood previously treated for 24 h with either herbicide (Lane 1, isoxaben, cellulose inhibitor), buffer (Lane 2) or fungicide (Lane 3, Maxim). (J) Corresponding Taxol HPLC quantification. (K) Corresponding effects on expression of endophytic fungal and plant 18S rRNA, and rate-limiting enzymes in the plant Taxol pathway (plant TS, taxadiene synthase) and plant terpenoid pathways (plant DXR, non-mevalonate pathway; plant HMGR, mevalonate pathway) (unit expression/plant fresh weight) [See Additional file 4 for statistics]. To confirm the above results independently, the same fungicide (Maxim XL) was also applied to mature Taxus wood. Since it was not feasible to treat mature trees with fungicide, fresh wood pieces (4–6 per biological replicate pool) from a mature T. x media tree (Figure 3H, >30 years old) were instead harvested and treated in vitro. Wood pieces were exposed to fungicide or buffer for 24 h, incubated for two weeks and then pooled prior to analysis. The fungicide treatment again caused declines in plant Taxol based on TLC analysis (Figure 3I, Lane 3) and confirmed by HPLC (Figure 3J). The high specificity of the fungicide was again confirmed by decreased expression of fungal 18S rRNA compared to plant 18S rRNA (Figure 3K, Lane 3). However, the effect of the fungicide may have been artificially exaggerated in the mature wood experiment (75% decline in Taxol, Figure 3J) compared to the plantlet experiment (20% decline, Figure 3F) as the two-week in vitro wood incubation allowed growth of endophytic fungus in the buffer control (Figure 3H). Two-way ANOVA (tissue type versus treatment) statistically confirmed that the fungicide treatments caused significant declines in plant Taxol [see Additional file 4]. These data suggested a significant relationship between resident endophytic fungi and plant Taxol production in nature. To determine whether the contribution by endophytic fungi to plant Taxol was the result of direct fungal biosynthesis of Taxol or elicitation of plant Taxol biosynthetic enzymes, expression of key genes in the plant Taxol pathway were assayed following the fungicide treatments in both young plantlets and mature wood. The diterpenoid taxane backbone of plant Taxol is derived from DXR, a key enzyme in the MEP pathway . Fungicide treatment resulted in decreased levels of DXR transcript in both intact plantlets (Figure 3D, Lane 2 and Figure 3G, Lanes 3 and 4) and mature wood (Figure 3K, Lane 3). The expression of another plant enzyme was tested, HMGR, the rate-limiting step in the cytosolic mevalonate (MVA) pathway which contributes to the taxane ring but only in old Taxus trees [19, 20]. Fungicide treatments caused no obvious decline in the expression of HMGR in young plantlets (Figure 3D, G), but caused a decline in older wood (Figure 3K, Lane 3). Finally, in both young plantlets and old Taxus wood, fungicide treatments caused a reduction in the expression of plant taxadiene synthase (TS), the rate-limiting step in the plant Taxol pathway  (Figure 3D, G and Figure 3K, Lane 3). This result was verified at the protein level using a polyclonal antibody for Taxus TS (Figure 3G). It was theoretically possible that some of the observed decline in TS protein may have been caused by decreased fungal TS as it cross-reacts with the plant antibody [see Additional file 6]. However, as the plant TS RT-PCR primers used never recognized pure cultures of Paraconiothyrium SSM001 TS (Figure 3G, Lane F), the simplest explanation is that endophytic fungi elicit plant TS transcription or transcript accumulation. It should also be noted that primers for plant HMGR and DXR did not amplify fungal endophyte RNA (Figure 3G, Lane F). Six months later, an independent set of Taxus plantlets was injected with Maxim-XL fungicide or buffer and showed similar results as the first set of experiments [see Additional file 7]. The primers used to quantify expression of Taxus taxadiene synthase (TS), DXR and HMGR, never amplified any fungal bands using fungal templates. Several other Taxus plant primers (regular or degenerate) designed from conserved sequences sometimes amplified a band, but further sequencing demonstrated that these fungal amplicons were not authentic TS, DXR or HMGR [see Additional file 8]. 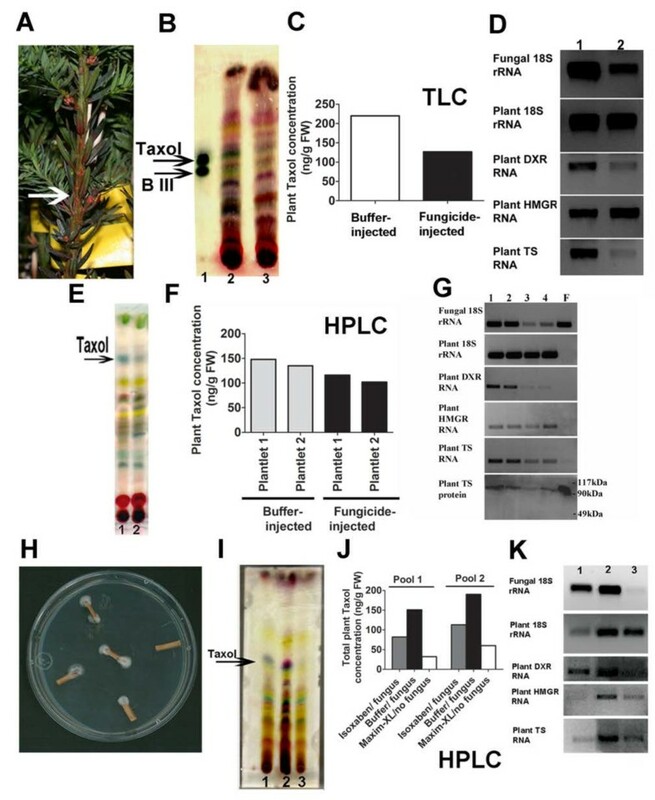 These independent results in young plantlets and old Taxus wood demonstrate that endophytic fungi contribute to plant Taxol yield by eliciting transcription of rate-limiting early and late steps in the plant Taxol pathway. However, these results do not exclude a direct biosynthetic contribution by fungi to plant Taxol. In parallel with the fungicide treatments, fresh Taxus x media mature wood pieces (Figure 3H) were simultaneously treated with isoxaben, a herbicide predicted to be specific for plants rather than fungi as it is a cellulose inhibitor . Wood pieces were exposed to herbicide or buffer for 24 h, incubated for two weeks and then pooled (4–6 pieces per biological replicate) prior to analysis. Though the herbicide treatment caused a much greater decline in the expression of plant 18S rRNA, HMGR and TS compared to the parallel fungicide treatment (Figure 3K), plant Taxol yield was more affected by the fungicide treatment (Figure 3I, J) which reduced endophytic fungal 18S expression to a much greater extent (Figure 3K). Therefore, in this in vitro system, fungi made a greater contribution to Taxol yield than cultured wood alone. The highest Taxol yield occurred when both plant 18S rRNA and fungal 18S rRNA expression were high suggesting that the ecological interaction may be important for maximum Taxol biosynthesis in planta. It was surprising that the fungal endophyte SSM001 would induce plant Taxol biosynthesis in planta, given that the endophyte can produce the same metabolite by itself, at least in vitro. As Taxol was reported to have fungicidal activity, we hypothesized that SSM001 might stimulate plant Taxol in order to inhibit its fungal competitors in planta. Strain SSM001 was isolated from Taxus wood. We applied Taxol (HPLC grade, Sigma #T7402 isolated from Taxus brevifolia) to three different fungi known to infect conifer wood: Heterobasidion annosum, Phaeolus schweinitzii and Perenniporia subacida, of which P. schweinitzii is known to infect Taxus wood [35–37]. Taxol inhibited the growth of all three wood decaying fungi (Figure 4). However, Taxol did not inhibit growth of an Alternaria fungus that we had isolated earlier from Taxus bark, nor a tree endophyte (Pestalotiopsis ssp.) or a non-tree pathogen of corn, Fusarium graminearum (Figure 4). Critically, Taxol also did not inhibit growth of the SSM001 endophyte (Figure 4). This data suggests that Taxol acts as a fungicide against potential fungal competitors of endophyte SSM001 that might share its wood environment, though not against the endophyte itself. The effect of Taxol on the growth of Paraconiothyrium SSM001, other endophytes and pathogens including wood decaying fungi. Taxol was added to each fungus at a concentration of 12 μM, compared to the solvent control. Shown are the following fungi: Taxus endophyte Paraconiothyrium SSM001; three wood decaying fungi (Heterobasidion annosum, Perenniporia subacida, and the Taxus pathogen, Phaeolus schweinitzii); a crop pathogen (Fusarium graminearum), a tree endophytic fungus (Pestalotiopsis spp. ), and an isolate of Taxus bark (Alternaria ssp). Taxol only inhibited the growth of the three wood decaying fungi. Several earlier reports showed that Taxol levels in suspension cultures  and intact trees [23, 24] vary by up to 125-fold, but the underlying reason has never been shown. Independent studies showed that Taxol-producing fungal endophytes elicit the production of Taxol from in vitro Taxus cell cultures , though did not determine the mechanism of elicitation. Here we present data that these two phenomena are mechanistically related. Specifically, we have shown that tree-to-tree, and even branch-to-branch, variation in Taxus plant Taxol accumulation positively correlates with the quantity of a resident Taxol producing fungal endophyte, in this case Paraconiothyrium SSM001 (Figure 1, 2). The underlying mechanism involves endophyte-induced transcriptional activation of rate limiting genes in the plant Taxol biosynthetic pathway (Figure 3). Given that the natural environment of the endophytic fungal strain is Taxus wood, and that Taxol was reported to be a fungicide , we hypothesized that the endophyte might stimulate its host to produce Taxol in order to inhibit fungal competitors that could also colonize the same woody environment. Consistent with this hypothesis, Taxol inhibited growth of fungi known to infect conifer wood including Taxus wood (Figure 4). Nevertheless, this raises an important question as to why the endophyte needs to stimulate the host plant to produce Taxol when the endophtye can produce the same secondary metabolite by itself, at least in vitro. We propose that this endophyte strategy may be to prevent colonization by its competitors but at minimal metabolic cost to itself. We have recently shown that Taxol biosynthesis in this fungal endophyte (Paraconiothyrium SSM001) consumes expensive terpenoid and phenylpropanoid pathway metabolites . Such a relationship between Taxus and its fungal endophyte, wherein the endophyte takes advantage of its host, would represent an interesting example of commensalism. These results raise the reverse question: why does the Taxus host retain an endophyte that produces a secondary metabolite that it can synthesize on its own? Our results even demonstrate that an antibody raised to recognize taxadiene synthase (TS), the rate limiting step in plant Taxol biosynthesis, strongly cross reacts to the apparent endophyte TS (Figure 3G), a result which appeared to be confirmed using a negative control (non-Taxol producing Fusarium fungus) and positive controls (two fungal Taxol elicitors) (Additional file 6). This result suggests a shared evolutionary relationship between plant and fungal endophyte Taxol biosynthetic pathways, rather than convergent evolution. One attractive possibility is that if a pathogen were able to successfully colonize the host, the plant may not be able to produce Taxol locally due to the resulting plant tissue damage. By the host maintaining a Taxol-producing endophyte, even at a metabolic cost to itself in the short-term, it may afford itself long-term protection against systemic infection in situations where it can no longer produce the Taxol fungicide – a temporal form of symbiosis. Testing this hypothesis would require being able to chemically trace the biosynthetic origin of Taxol in planta before and after a fungal pathogen infection. Other fungi have also been shown to elicit plants to produce terpenoid-based compounds in planta[30–32]. Arbuscular mycorrhizal fungi induce the accumulation of mycorradicin in gramineous plant roots by inducing 1-deoxy-D-xylulose 5-phosphate synthase (DXS) and DXR, two key enzymes in the MEP pathway [30, 31]. Terpenoid production in Euphorbia pekinensis (Rupr) plants increases upon inoculation with the endophytic fungus, Phomopsis sp., by induction of plant phenylalanine ammonia-lyase (PAL) and DXR. Finally, fungal elicitors have been shown to induce biosynthesis of the anti-malarial terpenoid, artemisinin, in Artemisia annua (L.) plant suspension cells . On a cautionary note, as only a modest correlation was observed between SSM001 and plant Taxol concentrations, and since the fungicide treatments did not specifically target SSM001, it is possible that other fungi within Taxus might also elicit plant Taxol biosynthesis, consistent with Taxol acting as a fungicide. Recently, we also demonstrated that other fungi inhabiting Taxus can elicit Taxol production from the endophytic fungus in vitro, raising the possibility of complex elicitor interactions on Taxol accumulation in planta. Taxol levels in intact Taxus trees were known to vary considerably from tree to tree but for unknown reasons. Comparing five Taxus species, good correlation was observed between plant Taxol content and the quantity of its Taxol-producing fungal endophyte. Measuring different adjacent branches within an individual Taxus plant, Taxol yield correlated with micro-scale variation in the amount of the endophyte. Fungicide treatment of intact Taxus plants or wood caused declines in both endophyte concentrations as well as plant Taxol accumulation, consistent with the correlation results. The fungal endophyte was found to affect plant Taxol yield by eliciting transcription of rate-limiting genes in the plant Taxol biosynthetic pathway. Taxol was an effective fungicide against fungal pathogens of conifer wood, the natural habitat of the Taxol-producing endophyte. The endophyte itself was resistant to Taxol. These results show that the fungal endophyte stimulates its host to produce a fungicide to which it is resistant, perhaps to prevent colonization by its competitors but at minimal metabolic cost to itself. To the best of our knowledge, the Taxol-producing fungal endophyte-Taxus relationship represents an unusual type of plant-endophyte interaction reported in nature, wherein both partners synthesize and potentially benefit from the same secondary metabolite. The general experimental design, reagents and materials are described in an Additional file [see Additional file 9]. Previously, a Taxol-producing endophytic fungus was cultured from old branches of Taxus x media plants cultivated on the University of Guelph Main Campus and Arboretum  (Guelph, Canada). The fungal ITS sequence matched to Paraconiothyrium spp [see Additional file 2], and the fungus was assigned the name Paraconiothyrium SSM001 . For taxonomic classification and to ensure consistency between experiments, every fungal culture was genotyped by PCR and DNA sequencing of the internal transcribed spacer regions (ITS) of 18S rDNA  to confirm both strain identity and purity [see Additional file 9 for details]. Specific fluorescent labelled fungal 18S primers were used for amplification. The primer sequences were nu-SSU-0817 5`-TTAGCATGGAATAATRRAATAGGA-3’ and nu-SSU-1536 5’-ATTGCAATGCYCTATCCCCA-3’ which amplify a 762 bp fragment . TRFLP separation analysis used a capillary electrophoresis ABI prism 310 DNA Sequencer (PE Applied Biosystems, Canada). TRFLP data was analyzed using ABI Prism 310 Collection version 2.0 and Peakscanner Analysis Software (version 1.0) [see Additional file 9 for details]. Taxol was verified and quantified either by a competitive immunoassay procedure [42, 43], TLC spot densitometry [44, 45] or by HPLC-UV. Additional details have been published  and are in an Additional file [see Additional file 9]. PDA plates were mixed with different concentration of the Maxim XL fungicide (0, 0.1, 0.5, 1.0, 1.5, 2.0, 2.5, 5.0 μM), and left to dry. A small piece of fungal mycelia was cultured separately on each plate surface and the plates were kept in the dark at room temperature for two weeks. Fungal mycelial growth was observed by the naked eye. In a pilot experiment, three different volumes (200 μL/plant, 500 μL/plant and 1 mL/plant) of Maxim XL fungicide (Syngenta) were injected into stems of one-year old Taxus x media plantlets or buffer (water). This was followed by RNA extraction and quantification of fungal endophytes by RT-PCR using specific fungal primers. In comparison to buffer injected plantlets, only 1 mL of fungicide/ plant was effective in decreasing the amount of endophytic fungi including Paraconiothyrium SSM001 using fungal 18S quantification. Subsequently, one-year old T. x media plantlets were injected with 1 mL/plant fungicide into the stem just passing beyond the outer bark. The plantlets received another two doses of the fungicide two months apart. The plantlets were left to grow for another 5 months with weekly watering. The plantlets were kept at room temperature (25°C) under 24 h cool white fluorescent light (60–80 μmol m-2 sec-2). Both the control and treated plantlets were arranged randomly. Only the stems were analyzed. For each biological replicate, 4–6 wood pieces randomly pooled from fresh T. x media branches of mature trees obtained from the University of Guelph Campus, were incubated with 15 μM of either Maxim-XL fungicide (consists of 25 g/L fludioxonil, 10 g/L metalaxyl-M), isoxaben herbicide (N-(3-(1-ethyl-1-methylpropyl)-5-isoxazolyl)-2,6-dimethoxy benzamide powder), or buffer (water) for 24 h in the dark at 25°C with shaking at 50 rpm. The wood pieces were then washed with water three times and then sterilized as mentioned earlier prior to culturing on PDA medium for 2 weeks. Four grams of each treated wood were ground, and 50 mg was used for RNA extraction; the remainder was used for taxane extraction and Taxol quantification. To test for the fungicide effects of Taxol, Paraconiothyrium SSM001 and six plant fungal pathogens and endophytes were incubated separately on PDA plates containing Taxol or the solvent control. Based on the literature and testing serial concentrations of Taxol (data not shown), 12 μM Taxol was chosen as the IC50. The following fungal pathogens were chosen: Heterobasidion annosum, Perenniporia subacida, an Alternaria ssp., a Pestalotiopsis ssp., Phaeolus schweinitzii and Fusarium graminearum. In all the experiments, the fungal plates were incubated in the dark at 25°C and the fungal growth was followed for one week. For the gene, 3-hydroxy-3-methyl glutaryl CoA reductase, primers PlantHMGRF2 (5’-TCCCTGTGGGTGTTGCAGGGC-3’) and PlantHMGRR2 (5’-AACCTAACAACGGAGCCC -3’) were used. For 3-deoxy xylulose-5-phosphate reductoisomerase (DXR), primers PlantDXRF4 (5’-AGGTGGAACCATGACTGG-3’) and PlantDXRR4 (5’-TGCAGCATACTTTCTGGCCC-3’) were used. For taxadiene synthase, primers TSinF (5’-GGTTTGCTCCAAATCAGGGC-3’) and TSinR (5’-TAACATTGTGGTGCCACAGA-3’) were used. For fungal quantification, fungal 18S rRNA specific primers were used: 18SrDNA-RtF (5’-GGCATCAGTATTCAGTTGTC-3’) and 18SrDNA-RtR (5’-GTTAAGACTACGACGGTATC-3’) . Taxus 18S rRNA was used as an internal standard for normalization using the following primers: Tax18SF2 (5’-TTTTCCCTTTGCAATGCC-3’) and Tax18SR2 (5’-TCGCCCTTGTAATAACCCG-3’) [see Additional file 9 for details]. Proteins were extracted from liquid nitrogen-ground Taxus stem tissues using extraction buffer  supplemented with 1% glycine  followed by SDS-PAGE on 12% acrylamide gels  and transferred to nitrocellulose membrane  followed by immunoblotting using a polyclonal anti-TS antibody [see Additional file 9 for details]. We would like to thank Rodney Croteau (Washington State University) for the gift of anti-taxadiene synthase antibodies. We thank Sean Fox (University of Guelph Arboretum) for help with collecting Taxus samples. We thank Allan McFadden (Dow Agrochemicals, Canada) and Francois Tardif (University of Guelph, Canada) for assistance with herbicides. We thank Angela Holliss (University of Guelph Genomics Facility) for tRFLP analysis This research was supported by a generous scholarship to SSMS from the Government of Egypt, and by a grant to MNR by the Ontario Ministry of Agriculture, Food and Rural Affairs (OMAFRA). SSMS and MNR designed the research, analyzed the data and wrote the paper. SSMS performed the research. RC helped on the LC-MS and HPLC analysis. CPT and JG helped with the Western blot analysis. All authors read and approved the final manuscript.